Australian sheep arena trials and to a lesser degree utility trials have been held since 1878. 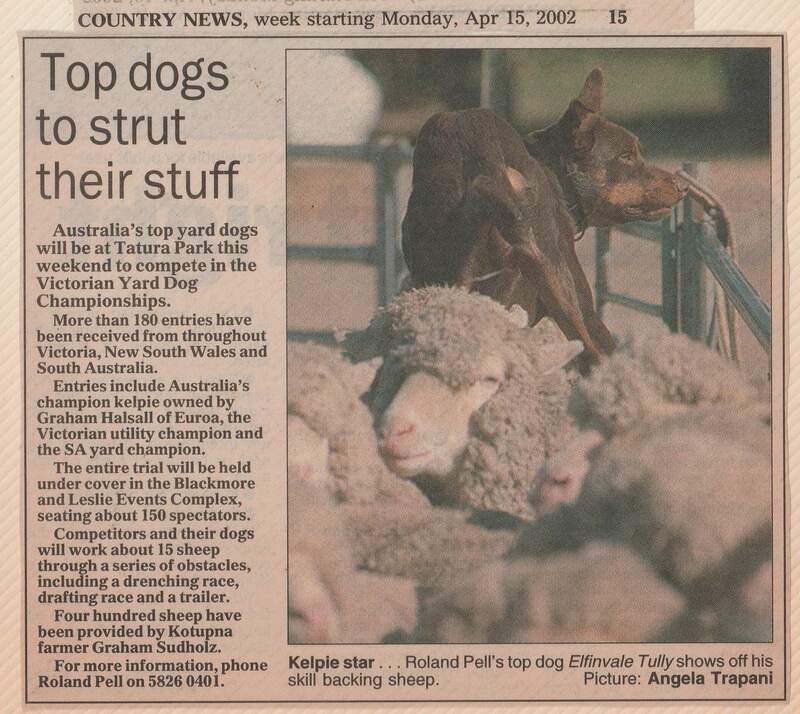 However, the present day yard, utility and farm dog trials can be traced back to a general meeting of the “National Kelpie Council” held during the 1979 National Kelpie Trail at Holbrook in NSW. It was at this meeting that John Gedye and Greg Harris raised an important issue. They claimed that the utility trials that were being held were not representative of the sheep and dog work that was being carried out on farms and station properties throughout Australia. They suggested that a different trial format was needed. Perhaps a trial with a greater emphasis on yard work, a larger number than five sheep to be drafted and greater freedom given to the handler to show ‘stockmanship’ as well as ‘dogmanship’. A very lively discussion ensued! This challenge set the wheels in motion. What followed was the birth of the Victorian Utility & Farm Dog Trials as we know them today. 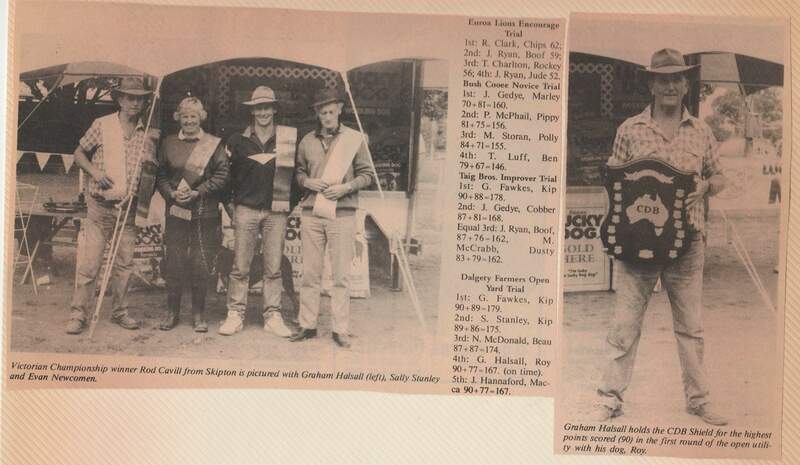 Greg Harris, John Gedye, Peter Austin and Kate Austin formed a Committee to run the National Kelpie Trial in 1981. A lot of discussion took place as to how the trial would be run. It was agreed that eight sheep would be worked down the ground of which three would carry a raddle (spray mark). There would be a 230 metre cast into a holding circle and then the yards. At the gateway into the yards an arc would be drawn and the handler could take up any position within the arc, or move within the arc to assist balance to obtain a flow into the yards. Thirty two other sheep would remain in the yard, giving a draft of forty sheep. There would be a three way draft with the first two and the last three straight ahead (to be taken off the ground); the three raddled sheep drafted to one side and the thirty two other. These would be run through to a holding yard for the next competitor. The three raddled sheep would be worked out of the yard over a water bridge and penned. James Weatherly kindly volunteered the use of his front paddock, his sheep yards, shearing quarters and the kitchen of this “Woolongoon” property, a few kilometres out of Mortlake in Victoria. He also provided 1600 one mark wethers to be used. This trial was held on the 26th, 27th & 28th February, 1981. The winner of both the novice and championship was Malcolm Peak, working Liscannor Kay. 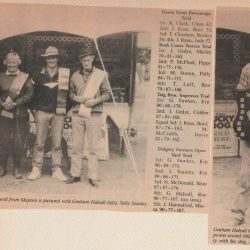 Lance Clifford ran a shortened version of the yard dog trial, in the St Helen’s sale yards in Tasmania on the 2nd August 1980. It was on the arena of the St Helens Agricultural Show and it replaced their usual three sheep arena trial. 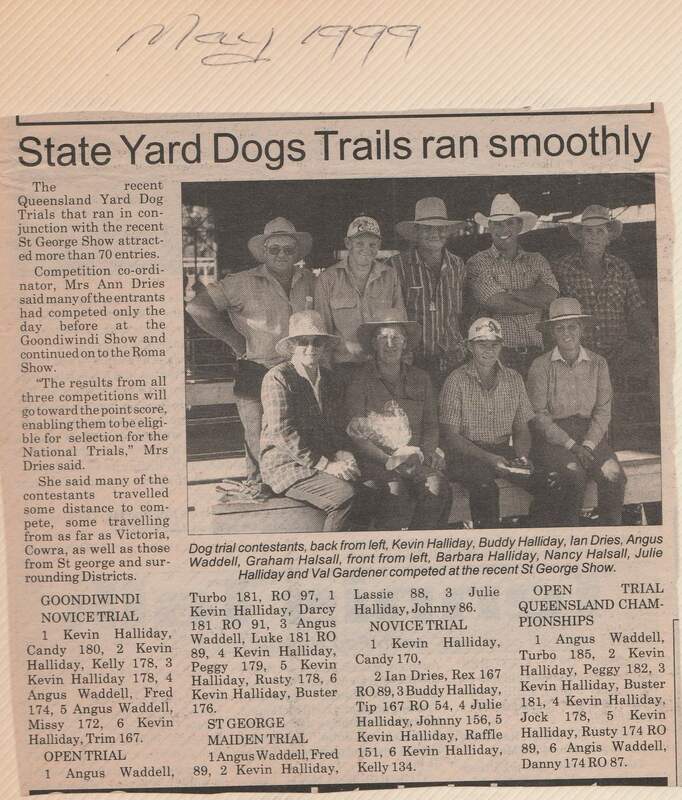 A small field competed and Lance termed this the “Tasmanian Yard Dog Championship”. The late Neil Berwick, a local transport driver judged the trial. Tasmania held a similar trial in 1981 and Greg Harris was flown over to judge this trial. 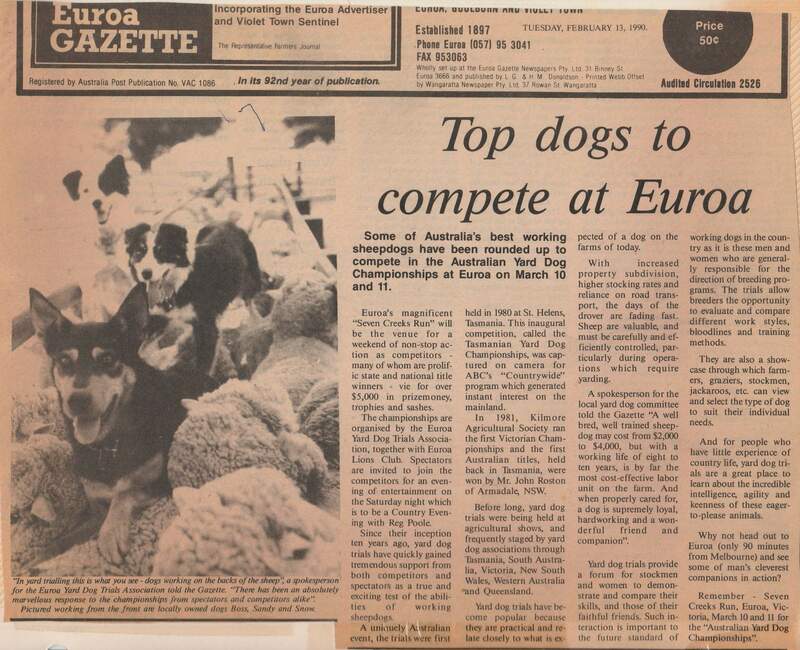 Lance held a meeting to establish a Australian National Yard Dog Committee in October, 1982. 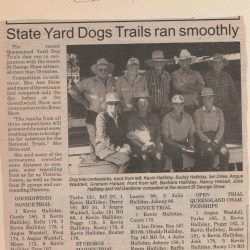 Yard Dog Trials, as they were beginning to be called, took off quickly and spread throughout Australia. They could be held in a small area, and local shows and field days saw them as an added attraction. Utility trials of this modern type spread at a slower pace as more space and organisation was needed to stage them. In 1984 Andrew King and John Gedye were invited to attend a meeting at Hamilton in Victoria. 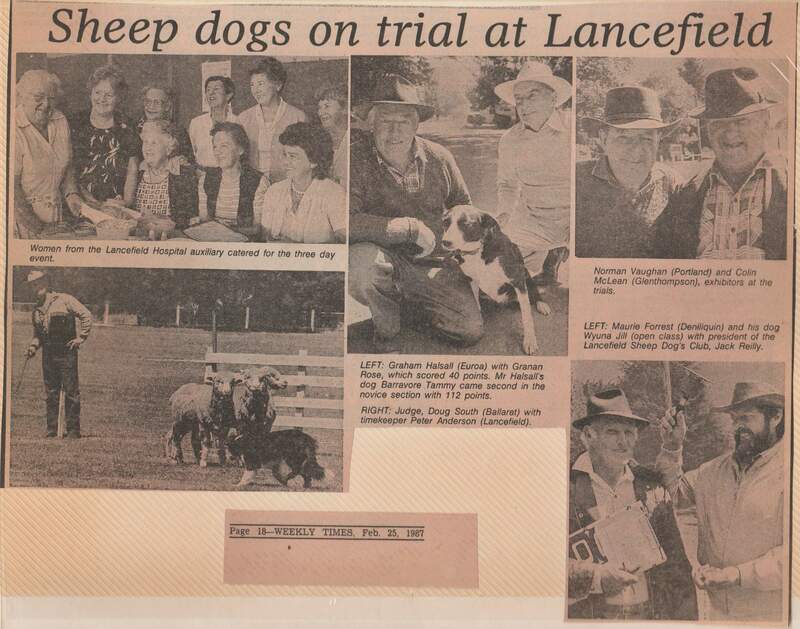 This was in the hope that a sheep dog trial could be set up at the annual “Hamilton Sheepvention.” The Sheepvention committee wanted this trial to be a Victorian Championship. After hours of discussion it was agreed that the area available was too small for a utility trial. 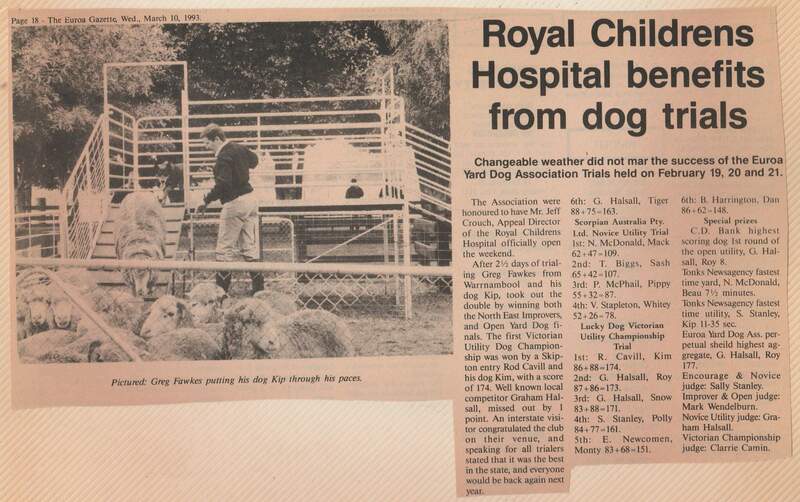 As the Victorian Yard Dog Championship title had already been claimed by Kilmore, the idea of a farm dog trial or a held way between trial was proposed. This trial would have a reasonable distance cast, say 80 metres. There would be yard work and one obstacle outside the yards. This trial was a success and twenty two years later it is still running annually. In addition, similar trials are running in Dundonnell and other towns. 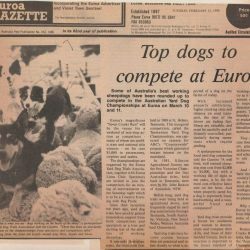 Tasmania formed their “Tasmania Yard Dog Association” in 1980 and claimed the “Australian National Yard Dog Association/Committee” title in 1982. NSW requested a “NSW Yard Dog Association” as well. Victoria, however, took their time. John Gedye was approached on several occasions to kick off an Association in Victoria, but his personal view at that stage was just to let those trials run in all different formats. He felt that they should be allowed to develop before being tied down with strict rules that committees always seem to impose. John felt the more variations that were present in the trials, the better the challenge. 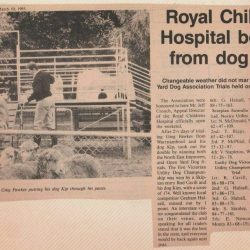 In 1986 Bob Peake attempted to get a Victorian Yard Dog Association formalised. However, in doing this he made the unpopular move to affiliate it with the “Victorian Working Sheep Dog Association”. The three sheep workers did not support this, neither did many of the competitors working yard, farm and utility trials. Needless to say this attempt failed. In 1990 John Gedye had a change of heart. He asked Nancy Halsall if she would consider taking on the role of secretary and help convene meetings if he attempted to form a Victorian Yard Dog Association. The meeting was held at the Melbourne Show Grounds on the 13th October, 1990. Ian Collie was elected President and Nancy Halsall Secretary. 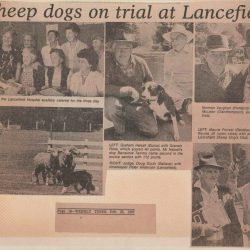 The name was changed to the Victorian Yard, Utility and Farm Dog Trial Association in 1992 to fully incorporate all the types of practical trials. 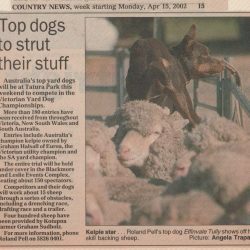 “to conduct sheep dog trials that are practical in nature and representative of the sheep work being carried out in Australia today”.